Market Lady Carolyn Smith tells us all about peaches! Peaches originated in China and are the oldest cultivated fruit. They have been called the “Queen of Fruits.” The lines to purchase peaches at many area farmers markets would indicate that is a good description of this popular fruit. It is hard to choose a peach by the exterior color because color varies by variety. A nice peach aroma is a clue to choosing a tasty peach. A peach should give slightly when squeezed in the palm of the hand but please don’t squeeze them at the market. 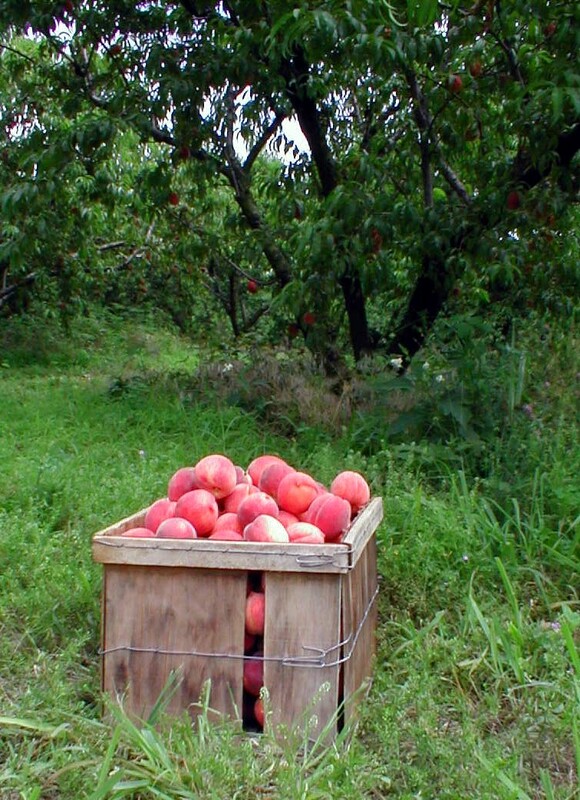 Market peaches are picked ripe and are fragile. A gentle squeeze will leave a bruise which neither you nor the next customer will appreciate. Peaches become softer after picking, but don’t actually ripen or become sweeter. They can be softened by placing them in a loosely closed paper bag for a few days. They are best stored at refrigerator temperature in a produce drawer. Under ideal conditions, they will keep for about a week. Peaches should be washed immediately before use. Dipping them in boiling water for one minute and then immediately in ice water will make the skins easier to remove. The addition of a citrus juice will help keep the fruit from browning if it is not going to be served immediately. For full flavor, remove the peaches you plan to use from the fridge the evening before serving. Peaches are an excellent, low calorie choice for a snack. A medium peach is less than 40 calories and is a very good source of Vitamin C and a good choice of Vitamins A and B, energy, potassium, carbohydrates, dietary fiber, and iron.Peaches do not have any cholesterol, saturated fat, or sodium. Peaches are in season, so visit your local farmers market and purchase a delicious, guilt-free snack.